﻿National Donut Day: Calendar, History, Tweets, Facts, Quotes & Activities. 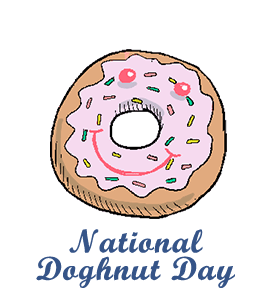 National Doughnut Day is a day of appreciation of Salvation Army volunteers who distributed doughnuts to servicemen during World War I. Doughnuts are fried circular pieces of dough that are usually topped with sugar syrups, chocolate, nuts and other flavorings. National Doughnut Day began in 1938 as a fundraiser for Chicago's Salvation Army. The fundraiser aimed to support the needy and honor the Salvation Army volunteers who donated their time during World War I to hand out doughnuts to the soldiers. When the US entered the war in 1917, Salvation Army huts were formed where many female volunteers were deployed to mother the soldiers. During this time, women began to make doughnuts for the servicemen who began to refer to the women as, Doughnut Dollies. This national holiday is celebrated each year on the first Friday in June. Popular theories have the doughnut as either an American, Dutch or British creation. According to Statista's market research survey of approximately 29,000 Americans, 61% of American households eat doughnuts. In the United States, there are more than 8,000 Dunkin Donuts restaurants, 1,000 Krispy Kreme Doughnuts restaurants, and more than 800 Tim Hortons locations. Philip Joseph Santoro of the USA holds the Guinness World Record for eating the fastest a jam doughnut with no hands and without licking the lips. He set the record with a time of 11.41 seconds on April 14, 2014. I have to stick to it because I found out last time that one doughnut doesn't do a thing. You've got to eat 20 a day for five weeks before you get results. - Renee Zellweger on her doughnut diet to gain weight for her film Bridget Jones's Diary. Visit your local doughnut store for specials and promotions to celebrate National Doughnut Day. Many doughnut stores offer free doughnuts or specials. Try to make your own doughnuts with your favorite toppings, or try new blends of sweet and savory toppings. Some interesting twists include maple bacon doughnut, smoked salmon doughnut and grilled cheese doughnuts! Become a volunteer with The Salvation Army. According to The Salvation Army, more than 30 million Americans received assistance from the Salvation Army's officers, employees and 3.4 million volunteers in 2014. Watch episodes of the Donut Showdown (2013) to learn about out-of-the-box donut recipes. The show is judged by chefs David Rocco, Maggie McKeown and Zane Caplansky. Each episode consists of contestants competing against each other to create unique donuts.